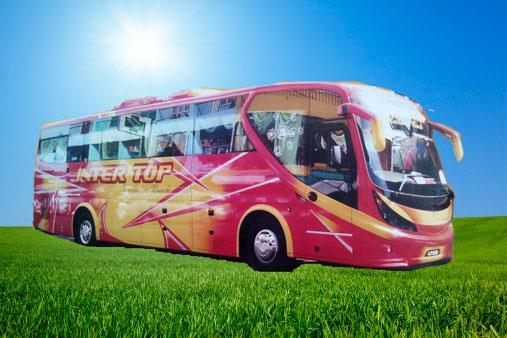 Hatyai Inter Top Express is an emerging bus company providing express bus services between Kuala Lumpur and Hatyai. The company runs 2 daily departure of VIP bus from Kuala Lumpur to Hatyai and vice versa. Besides Hatyai, the company also provide buses from KL to other northern region of Malaysia, including Butterworth, Penang, Sungai Petani, Alor Setar, Kuala Perlis (gateway to Pulau Langkawi) and many more. By joining BusOnlineTicket.com, Hatyai Inter Top Express can now provides online booking for customers traveling between Kuala Lumpur and Hatyai with an additional option. To board the bus from Kuala Lumpur, please proceed to Terminal Bersepadu Selatan (TBS) bus station. It is very easy to go to the station because of centrally located at the heart of Kuala Lumpur city area. Travelling to Hatyai from Kuala Lumpur will take around 12 hours. So, it is important that the bus must be comfortable. Hatyai Intertop Express ensure their customer comfort by proving good seats with plenty of leg space for them to stretch for the long hour journey travelling. Travel with Hatyai Intertop Express, with a piece of comfortable mind and enjoy your journey. Jalan Pudu, 50100 Kuala Lumpur.